Suggested Use Adults: Take two (2) minty chewable's daily. Not formulated for use in children. Do not exceed suggested use. Important Information Long-term intake of high levels of vitamin A (excluding that sourced from beta-carotene) may increase the risk of osteoporosis in adults. Do not take this product if taking another vitamin A supplements. Dietary supplements are manufactured to support the health and wellness of most individuals as well as to fill the nutrient gaps in their body. Pfizer, which produces Centrum Vitamints, is one of the leading biopharmaceutical companies in the world. 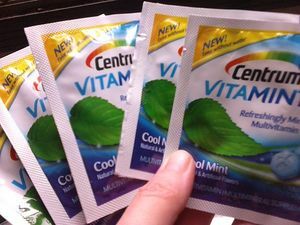 A free taste sample of the Centrum® VitaMints® was promoted by Smiley360. The packaging of the supplements is in a form of a sachet containing 2 tablets. On August 1, 2015, the Centrum Vitamints coordinators launched a Hamptons Paddle and Party for Pink at Bridgehampton, Sag Harbor, New York. There are several celebrities and influential people who attended the party including Lary Baum, Maria Baum, Lisa Klein, Gabby Reece, Nike Rodgers, Laird Hamilton, Myra Biblowit, Tracy Anderson and the TV personality, Bethenny Frankel. The Centrum Vitamints coordinators invited prestigious actors and actresses to pose together with the product at the EXTRA WEEKEND OF | LOUNGE event held last September 19, 2015, in the London West Hollywood, California. The event was hosted by the famous Mario Lopez of Extra, Charissa Thompson, and Tracy Edmonds. The photoshoot was collaborated and produced by the ON3 productions. Among the celebrities and popular guests, who attended the event are Jazmyn Simon, Robert Knepper, Anthony Anderson, Melanie Lynskey, Jane Lynch, Jason Morgan Ritter, Emma Myles, Clifton Collins Jr., Dascha Polanco and Anthony Jeselnik. On September 22, 2015, Robert Uccardi, Director for Centrum, said during a press conference that "Pfizer Consumer Healthcare is committed to bringing a range of exciting new Centrum multivitamin formulas that seamlessly fit into Americans’ everyday lives, including Centrum® VitaMints®, a surprisingly and refreshing mint tasting multi-vitamin that breaks through in a category traditionally known for tablets and gummies"
On September 22, 2015, Bahar Takhtehchian, Lifestyle and Wellness Expert said "Americans want to live well – they want to eat right and exercise often – however they are often short on the time needed to support an active, healthy lifestyle". Furthermore, he also added that "By offering a multivitamin in a flavor many consumers love, Centrum® VitaMints® give consumers an on-the-go option they enjoy like a mint that helps support energy, immunity, and metabolism." The Pfizer provided comment regarding the new launch of the Centrum Vitamints last September 22, 2015, as it quoted, "Centrum Vitamints is a refreshing and a complete multivitamin that provides a more enjoyable experience for consumers to get essential nutrients." Moreover, the Pfizer added to its statement that, "the Centrum Vitamints joins the other Centrum products to form one of the most comprehensive lines of multivitamins on the market." A latest advertisement was last aired on April 4, 2016 that entails the parody commercial of Centrum Vitamints. According to Rob Pritts, Director of the Ads, "We all agreed that the tone should be more curious calm than over the top. There had to be a layer of real to the surreal premise." Furthermore, he added to his remarks that, "most of the spot is without dialogue, so the expression is everything." As a summary, the advertisement involves a husband who went curiously about the Centrum Vitamints and opens it up to look what's inside. The husband was surprised of the icy blast minty refreshing breeze of the supplement as it literally splashes onto his face making his beard white as the snow. The actors and actress performed the ads were Patrick Wilkins as the husband and Terryn Westbrook as the wife. The director, producers, and staffs of the ads were Rob Pritts (Director), James Whitaker (DOP), John Gilliland (Executive Producer), Tammie Kleinmann (CEO), Teresa Cameron (Head of Production), Kevin Sharpton (Producer), Eric Routenberg & Amanda Butts (Creative Director), Caroline Ganson (Copywriter), Mona Jo (Art Director), Sean Pinney (Producer), Leo Burnett (Creative Agency), Mylene Pollock & Jeanie Caggiano (Executive Creative Directors), John Dingfield (Offline Editor), Peter Hullinger (Offline Executive Producer), and Lauren Roth & Joanna Woods (Offline Producers). Studies have shown that people over 50 years old generally suffer from chronic fatigue, insomnia (irregular sleep), poor diet, hormone-related psychopathological and pathophysiological disorders such as stress, and osteoporosis and these conditions take a heavy toll on their physical and mental well-being. The absorbent capacity of the nutrient content also reduces in the older people who necessitate higher intake of calories that are full of nutrition. Getting adequate nutrition can be a challenge as you get older. The number of calories you need begins to decline. Every calorie you consume must be packed with nutrition. The body becomes less efficient at absorbing some key nutrients. Several key nutrients, in particular, may be in short supply as you get older. Proper and regular intake of multivitamins like Centrum® VitaMints® can help meet the nutrients necessary for the body as a requirement to promote health and wellness as well as to increase the energy levels and build the immune system of an ageing person. According to the survey conducted by Prevention and Centrum®, almost 75% of the Americans perceived that taking vitamins and minerals based on the recommended daily servings, is the key to suffice the body with essential nutrients and to promote holistic care. The National Health and Nutrition Examination provide its assessment regarding Centrum Vitamints products, in which 9 out of 10 Americans do not get the ample amount of nutrition if they solely depend on food alone. These supplements are produced as per the Food and Drug Act (PFDA) 1906 and the Food Safety Modernization Act of 2010 (FSMA) ensuring safe and quality products as per the specific needs of the people. 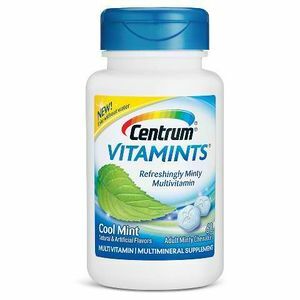 The Centrum® VitaMints® is formulated with a minty taste made from artificial sweeteners, which include sucralose and acesulfame potassium as well as a content of peppermint flavor. The chemical formula of sucralose is C12H19Cl3O8 and it is mostly used as a popular sweetener in baking products, beverages, candies and healthcare products. It has no adverse effects on the total human body weight because it contains no calories. On the other hand, acesulfame potassium is also a sugar-free substitute and its chemical compound formula is C4H4KNO4S. Like the aforementioned substance, acesulfame potassium has no calorie contents and it is utilized as a food additive for shelf life prolongation and preservation of most therapeutic vitamins. 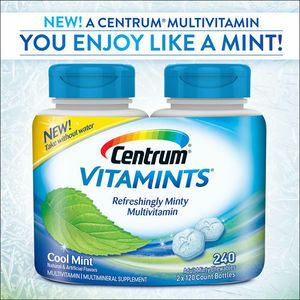 The artificial color used for the Centrum® VitaMints® is Blue 2 Lake. It is a gluten-free supplement and does not constitute any allergenic proteins such as crustacean shellfish, wheat, soybeans, milk, fish, tree nuts, eggs, and peanuts. In addition, the tablet is concocted with vitamin sources derived from the lanolin (extracted from a sheep’s wool) and gelatin (comes from the pork meat). The Centrum® VitaMints® is intended for adults aged 19 and above. It should not be taken by children because of the high levels of vitamin and mineral content. For adults, this product should not be simultaneously taken with another multivitamin supplement. Pregnant and feeding mothers should consult their healthcare professionals before taking Centrum® VitaMints®. Long-term intake of high levels of vitamin A (excluding that sourced from beta-carotene) may increase the risk of osteoporosis in adults. Do not take this product if taking another vitamin A supplements. The Centrum® VitaMints® boosts and sustains the energy levels of an individual with the aid of Chromium and B-vitamins. It supports the digestion mechanism for burning saturated and unwanted fats because of the molecular function of Chromium as a dietary supplement. In particular to B-vitamins, B6 and B12 enhance the metabolism rate due to the presence of pyridoxine present in B6 while cobalamins contents in the B12. It helps to improve the immunity system provided by the essential antioxidant elements constituting Zinc, Vitamin C, and E. Moreover, the B-vitamins can promote weight loss thus, enhancing the metabolism process that synthesizes proteins, carbohydrates, and fats. VITAMIN D  It boosts the immune system to defend the body from diseases and aids in the prevention of cancer. It is also acts as antioxidant to reduce free radical inside body. It is used to treat bones, heart and blood vessels. In addition, it regulates the calcium and phosphorus to balance the elements ingested in the human body. MANGANESE  It can treat manganese deficiency, osteoporosis, anemia, and symptoms of premenstrual syndrome (PMS). VITAMIN B6  It is used to treat heart diseases, anemia, high cholesterol, bladder infections, kidney stones, eye infections and helps in preventing cancer and boosting the immune system. VITAMIN C  The chief functions of this element are to boost the immune system, prevent asthma, osteoporosis, diabetes, heart attacks and high cholesterol. VITAMIN E  Vitamin E can be used to treat cataracts, asthma, respiratory infections, skin disorders, aging skin, sunburns, cystic fibrosis, infertility, impotence, chronic fatigue syndrome, peptic ulcers, and is also sometimes used for improving the strength, enhancing the muscles, reduces the muscle damage and develop physical endurance. IODINE  Humans need iodine for normal thyroid function, and for the production of thyroid hormones. FOLIC ACID  One of the best treating elements for memory loss, weak bones, muscle pain, heart diseases, nerve pain, and stroke. Pregnant women also take folic acid to prevent miscarriage and birth defects. Vitamin B6 may cause abnormal heart rhythms, acne, allergic reactions, breast enlargement or soreness, changes in folic acid levels, decreased muscle tone, drowsiness or sedation, feeling of a lump in the throat, feeling of tingling on the skin, headache, heartburn, loss of appetite, metallic taste, nausea, rash, recurrence of ulcerative colitis (an inflammatory bowel disorder), stomach discomfort or pain, sun sensitivity, vomiting, and worsened asthma.Side effects to some ingredients of high-dose pyridoxine hydrochloride (which is injected into the vein) are possible. Vitamin B6 may cause low blood pressure. Caution is advised in people with blood pressure disorders or in those taking drugs or herbs and supplements that lower blood pressure. Vitamin B6 may affect blood sugar levels. Caution is advised in people with diabetes or low blood sugar, and in those taking drugs, herbs, or supplements that affect blood sugar. Blood sugar levels may need to be monitored by a qualified healthcare professional, including a pharmacist, and medication adjustments may be necessary. Vitamin B6 may increase the risk of bleeding. Caution is advised in people with bleeding disorders or taking drugs that may increase the risk of bleeding. Dosing adjustments may be necessary. Use cautiously in people who have heart conditions or stomach and intestine conditions. Use cautiously in people taking agents for Parkinson's disease, as they may interact with vitamin B6. Avoid in people with known allergy or sensitivity to any ingredient in vitamin B6 products. Avoid in doses higher than 200 milligrams daily, due to the risk of nerve pain and seizures. Pregnancy and Breastfeeding: Vitamin B6 is likely safe for pregnant and breastfeeding women when taken by mouth in doses not exceeding the recommended daily intake. Avoid high doses during pregnancy or breastfeeding. A special product has been approved by the U.S. Food and Drug Administration (FDA) for use during pregnancy, but it should not be used long-term or in high doses without the guidance of a medical provider, due to the risk of seizures in infants. Taking Vitamin C supplements are generally regarded as safe in most individuals in recommended amounts. Vitamin C may cause abdominal cramps or pain, chest pain, dental erosion, dizziness, diarrhea, faintness, fatigue, flushing, gut blockage, headache, heartburn, increased risk of lung cancer, increased risk of Parkinson's disease, inflamed esophagus, injection site discomfort, nausea, red blood cell complications, skin tingling or irritation, slowing of endurance training, thickening of blood vessels close to the heart, urinary complications, and vomiting. High doses of vitamin C have been associated with multiple adverse effects. These include blood clotting, death (heart-related), kidney stones, pro-oxidant effects, problems with the digestive system, and red blood cell destruction. In cases of toxicity due to massive ingestion of vitamin C, forced fluids, and diuresis may be beneficial. Use cautiously in chronic, large doses. Healthy adults who take chronic large doses of vitamin C may experience low blood levels of vitamin C when they stop taking the high doses and resume normal intake. Vitamin C in high doses appears to interfere with the blood-thinning effects of anticoagulants such as warfarin. Caution is advised in people with bleeding disorders or those taking drugs that affect bleeding. Dosing adjustments may be necessary. Vitamin C may affect blood sugar levels. Caution is advised in people with diabetes or hypoglycemia, and in those taking drugs, herbs, or supplements that affect blood sugar. Blood glucose levels may need to be monitored by a qualified healthcare professional, including a pharmacist. Medication adjustments may be necessary. Vitamin C may increase blood pressure. Caution is advised in people with high blood pressure. Use cautiously in people with cancer (e.g. lung), cataracts, glucose-6-phosphate dehydrogenase deficiency, anemia and related conditions, disorders of the gut, kidney stones, or sickle cell disease. Use cautiously in people after angioplasty and in pregnant women at risk of high blood pressure during pregnancy. Use cautiously in greater than recommended doses in breastfeeding women. Use cautiously in people taking antibiotics, anticancer agents, HIV medications, barbiturates, estrogens, fluphenazine, or iron supplements. Use injected vitamin C cautiously, especially in high doses, as it may lead to kidney function problems. Use vitamin C tablets cautiously, as dental erosion may occur from chewing vitamin C tablets often. Avoid in people with known allergy or sensitivity to any ingredients in Vitamin C products. Avoid high doses of vitamin C in people with conditions aggravated by increased acids, such as advanced liver disease, gout, a disease where kidneys fail to remove extra acid from the body, or a disease with the early breakdown of red blood cells. Avoid high doses of vitamin C in people with kidney failure or in those taking agents that may damage the kidneys. Pregnancy and Breastfeeding: Vitamin C intake from food is generally considered safe during pregnancy and breastfeeding. Use cautiously in greater than recommended doses in pregnant and breastfeeding women. Use vitamin C cautiously in those at risk of high blood pressure during pregnancy. Vitamin D is likely safe when taken by mouth in doses of 100 micrograms of vitamin D3 daily (4,000 IU) and when applied to the skin alone or in combination with corticosteroids for up to three months. Vitamin D is possibly safe when taken by mouth or injected into the muscle in doses of 300,000 IU three times a year for vitamin D deficiency. Vitamin D may cause allergic skin reactions (inflammation, irritation, rash, and thinning), build-up of calcium in the arteries, changes in cholesterol levels, daytime sleepiness, excessive vitamin D levels, hardening of the arteries, headaches, increased calcium excretion or increased calcium blood levels, increased risk of falls and fractures, increased risk of heart attack and stroke, increased risk of high blood pressure during pregnancy, increased risk of urinary tract infection, kidney or urinary stones, muscle pain, respiratory tract infection, and stomach problems (constipation, cramps, diarrhea, upset stomach, and vomiting). Vitamin D may affect blood sugar levels. Caution is advised in people with diabetes or low blood sugar, and in those taking drugs, herbs, or supplements that affect blood sugar. Blood sugar levels may need to be monitored by a qualified healthcare professional, including a pharmacist, and medication adjustments may be necessary. Vitamin D may affect blood pressure. Caution is advised in people with blood pressure disorders or those taking drugs or herbs and supplements that affect blood pressure. Use cautiously in people with headaches, heart disease, immune disorders (including lymph cancer and tuberculosis), kidney disease, liver disease, lung disorders, musculoskeletal disorders, skin disorders, stomach disorders, and thyroid disorders. Use cautiously in pregnant women at risk of high blood pressure associated with pregnancy. Use cautiously in breastfeeding women. Avoid in people with known allergy or sensitivity to vitamin D, any similar compounds, or any part of the formula. Avoid in people with abnormal calcium excretion or levels. Pregnancy and Breastfeeding: Use cautiously in pregnant women at risk of high blood pressure associated with pregnancy. The recommended adequate intake for pregnant women is the same as for non-pregnant adults. Most prenatal vitamins provide 400 IU of vitamin D daily as cholecalciferol while high-risk populations may benefit from higher amounts (2,000-4,000 IU daily). Use cautiously in breastfeeding women. The daily recommended intake of vitamin D during breastfeeding is 400 IU (10 micrograms) daily. Vitamin D2 in doses of 2,000 IU daily or 60,000 IU monthly for three months has been found to be safe and effective. Exclusively breastfed babies may be supplemented with 400-2,000 IU daily. Vitamin E is likely safe when used in healthy adults at doses commonly found in food, and in healthy people over 65 at doses up to 800 IU taken by mouth daily for up to four months. Vitamin E is possibly safe in people with diabetes or those using agents that lower blood sugar. Vitamin E may cause allergic skin reactions (inflammation or itching), blurred vision, changes in cholesterol levels, changes in insulin resistance, diarrhea, dizziness, fatigue, flu-like symptoms, headache, heart conditions, increased risk of death, increased risk of fainting or falls, increased risk of heart failure, increased risk of high blood pressure in pregnancy, increased risk of stroke, increased risk of tuberculosis, kidney dysfunction, nausea, severe response to infection (in preterm babies), sexual dysfunction, stomach pain, vision loss, and weakness. Use cautiously in smokers and in people with Alzheimer's disease or mental decline, eye damage, kidney problems, heart conditions, and skin conditions. Use cautiously in preterm babies. Use cautiously when using long-term (more than 10 years). Vitamin E may increase the risk of bleeding. Avoid in people with bleeding disorders or taking drugs that may increase the risk of bleeding. Avoid using high doses by mouth or high doses injected into the vein. Avoid using high doses in pregnant women, due to the risk of heart problems in the baby. Avoid in people with known allergy or sensitivity to products that contain vitamin E. Pregnancy and Breastfeeding: Many prenatal vitamins contain small amounts of vitamin E. Natural forms of vitamin E may be preferred to man-made forms. Use cautiously in preterm babies. Avoid using high doses in pregnant women, due to the risk of heart problems in the baby. High doses of folic acid might cause abdominal cramps, diarrhea, rash, sleep disorders, irritability, confusion, nausea, stomach upset, behavior changes, skin reactions, seizures, gas, excitability, and other side effects. There is some concern that taking too much folic acid for a long period of time might cause serious side effects. Some research suggests that taking folic acid in doses of 800-1200 mcg might increase the risk of heart attack in people who have heart problems. Other research suggests that taking these high doses might also increase the risk of cancer such as lung or prostate cancer. Iodine For adults Recommended Dietary Amounts (RDA) have been set: people age 14 and older, 150 mcg/day, for pregnant women, the RDA is 209 mcg/day, and breastfeeding women, 290 mcg/day. the Tolerable Upper Intake Level is 1100 mcg/day. Common side effects include nausea and stomach pain, runny nose, headache, metallic taste, and diarrhea. In sensitive people, iodine can cause side effects including swelling of the lips and face (angioedema), severe bleeding and bruising, fever, joint pain, lymph node enlargement, allergic reactions including hives, and death. In both children and adults, there is concern that higher intake can increase the risk of side effects such as thyroid problems. Iodine in larger amounts can cause metallic taste, soreness of teeth and gums, burning in mouth and throat, increased saliva, throat inflammation, stomach upset, diarrhea, wasting, depression, skin problems, and many other side effects. When iodine is used directly on the skin, it can cause skin irritation, stains, allergic reactions, and other side effects. Be careful not to bandage or tightly cover areas that have been treated with iodine to avoid iodine burn. Q: Is it safe to take Centrum® VitaMints® with other Centrum® multivitamin products? A: Centrum® VitaMints® is a multivitamin containing most of the essential vitamins and minerals your body needs. Therefore, this product should not be taken with any other multivitamin products. We recommend always checking with your healthcare professional about the best regimen to follow for your dietary supplement needs. Q: Can Centrum® VitaMints® multivitamins be taken by children? 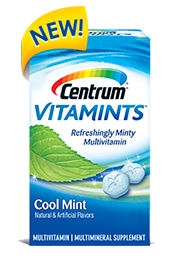 A: Centrum® VitaMints® is formulated for use in adults 19 years of age and up. This product is not intended for use in children. Q: What is the difference between Centrum® VitaMints® and other Centrum® chewable products? 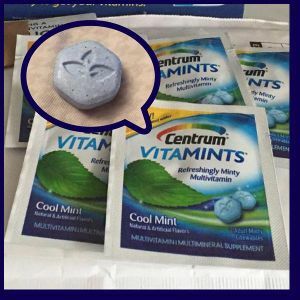 A: Centrum® VitaMints® is a minty chewable tablet that was designed to support nutrition, convenience, flavor and experience needs. There are differences in the formulations and serving sizes of our various chewable forms of multivitamin offerings (Centrum®MultiGummies, Centrum® Silver® Chewables, Centrum® Chewables, and Centrum® VitaMints®). While all Centrum® formulations are intended for adults, you can use the “Find Your Centrum® Tool” on our website to help you find the right Centrum® for you. Q: Is Centrum® VitaMints® vegetarian? Are there any animal derivatives in the product? If so, which animal? A: No. Centrum® VitaMints® contain gelatin (porcine) that is sourced from pork, and vitamin D is sourced from lanolin (sheep’s wool). Q: Is the mint flavoring from an actual mint derivative? Which one? A: The mint flavoring comes from natural and artificial mint and peppermint flavors. Q: Are Centrum® VitaMints® sweetened with artificial sweeteners? A: Yes, Centrum® VitaMints® contain the artificial sweeteners acesulfame potassium and sucralose. Q: Do Centrum® VitaMints® contain artificial colors? 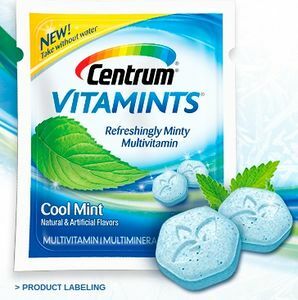 A: Yes, Centrum® VitaMints® contain the artificial color Blue 2 Lake. Q: Can I take Centrum® VitaMints® while pregnant or nursing? A: If you are pregnant or breastfeeding, please check with your healthcare professional before taking any supplement. Q: Can I take Centrum® VitaMints® with my medications? A: Please consult with your health professional before taking Centrum® VitaMints® with any medications. Q: Do Centrum® VitaMints® contain gluten? n A: No. Centrum® VitaMints® meet the FDA definition of gluten-free. Q: Do Centrum® VitaMints® contain any allergens? A: No. Centrum® VitaMints® do not contain any allergenic protein from the 8 major allergens (wheat, soy, milk, egg, peanuts, tree nuts, fish, and crustacean shellfish).